Block font based on Spacerite’s Splayed Corner Gothic. Both OpenType and TrueType formats included with the download. * Only the basic character set is shown here. 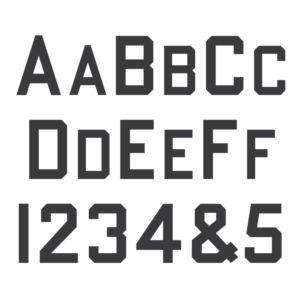 For a full character map sample view the Font Project page. Gothic and block styles of lettering were originally nearly always used for raised letters in the memorial trade, and in fact were sometimes simply referred to as “raised” in trade magazines. 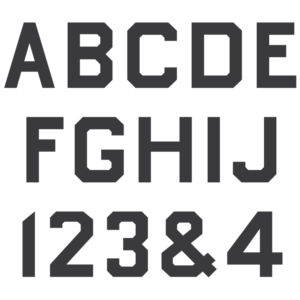 The Spacerite Company’s alphabets were eventually used mostly for sandblast work, but they were not originally designed only with this in mind – and this raised alphabet likely received much use with hand carving. The Splayed Corner Gothic was modified from the Round Corner Gothic by the Spacerite Company. It shares almost the same letter shapes and geometry, but with clipped, or “splayed” corners and all curves removed. 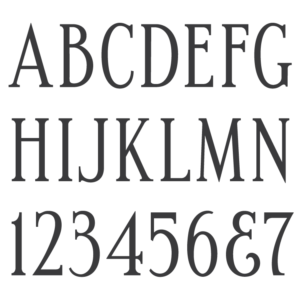 The alphabet was likely designed in the late 1930s or early 40s. The likely designer of the alphabet was Timothy Jellow, a memorial draftsman, lettering expert and creator of the Spacerite lettering system. The most distinct feature of the alphabet is the rounded inside corners – the outside corners obviously being “splayed” (cut at 45º angles). Both features were commonplace in the industry at the time, but most later block or splayed gothic alphabets in the industry did not contain the rounded inner corners, having sharp 90º angles. Many monument makers did simply cut straight lines and remove this distinct rounding, so it cannot be relied upon to identify the alphabet in the cemetery. The original alphabet contained some punctuation including a hyphen and an ampersand. All other punctuation has been created by the MLC. Two ‘Q’s have been included in the font, as the original metal ‘Q’ did not enclose the bottom of the tail, leaving room for the stencil cutter to extend it beyond what was possible for the physical plate. The second ‘Q’ may be accessed as an OpenType alternate in applications which support OpenType features.